Create sweet dessert twists on a traditional Asian and all American recipe. Creating mashups by combining food concepts from different cultures into surprising new dishes is a fun way to surprise and entertain your guests. This week, I’m making desserts inspired by asian dumplings and the all American PB&J. Both of these new dishes share a tasty and tangy strawberry dipping sauce that is really easy to prepare. if dumpling wrappers are frozen, allow a day for them to thaw in your refrigerator before making this recipe. Place graham crackers in a sealable plastic bag and crush them using a small pan or food can. Set aside. In a medium sized bowl, mix together Nutella, powdered sugar, cream cheese and food coloring. Transfer to a quart sized sealable bag. Squeeze out all of the air and push the filling to one corner of the bag. Cut a small hole in that corner so you can pipe filling onto the dumpling wrapper. Fill a small bowl with water and place it near your work surface. Keep wrappers covered until ready to use. Place a wrapper in your hand. Dip your finger in the water and moisten the edge of the wrapper halfway around. Place about 1/2 teaspoon of graham cracker crumbs in the center of the wrapper and squeeze about 1 1/2 teaspoon of Nutella filing over the crumbs. Fold the dry edge of the wrapper over the wet edge and seal to form a half moon shape. Make little pleats across the seal by making little folds next to each other all across the edge. Set completed dumpling aside and repeat with remaining wrappers. To cook, gently drop the dumplings into the boiling water. Cook for about 3-4 minutes. Remove dumplings with a mesh strainer or slotted spoon and transfer to a serving plate and sprinkle with just a bit of sugar. Decorate the plate with orange curls and mint. 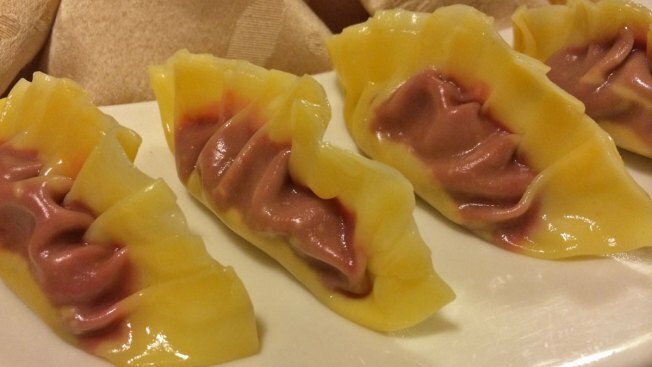 Allow dumplings to cool slightly and serve with strawberry sauce. Give your guests chop sticks and mini dipping bowls for the strawberry sauce. For an alternative sauce, add a bit of balsamic to the strawberry sauce in a separate bowl. Place strawberries in the refrigerator for a day to fully thaw (you can also place the contents in a class bowl and microwave on low until just defrosted, but sill slightly frozen in parts). Transfer berries to a blender or food processor. Add water and blend until ingredients are smooth. Add sugar and lemon juice and blend again until sugar has dissolved. Place sauce in the refrigerator until ready to use. Roll out one of the pie crusts onto a work surface. Roll out the second pie crust and center it on top of the first. Brush the beaten egg on the top surface and sprinkle 1 tablespoon of sugar over the whole surface. Turn both crusts over and repeat the process. Using the crimping tool, split the crust “pancake” into four equal quadrants. Working with each quadrant, cut strips about 1/2” wide. Because of the egg wash, parchment paper will keep the strips from sticking so roll out a piece to fit your baking sheet. Gently transfer the pairs onto the parchment paper and keep them from touching each other. Bake for 18-20 minutes until light golden grown. Remove from oven and allow to cool slightly. Place the peanut butter in a sealable bag. Squeeze out the air and push the filling to a corner. Cut a very small hole in the corner so you can pipe the peanut butter. Working with cooled strips, one at time, gently separate the pairs (if you have trouble, use a small paring knife to slide between the layers). Pipe a line of peanut butter down the center of bottom pair and cover with the top. Repeat with all strips. Stack strips randomly, like french fries, on serving plates and serve with strawberry sauce.